Traveling with Kate & Charles: The Routeburn Track: Repeat or Redemption? The Routeburn Track: Repeat or Redemption? 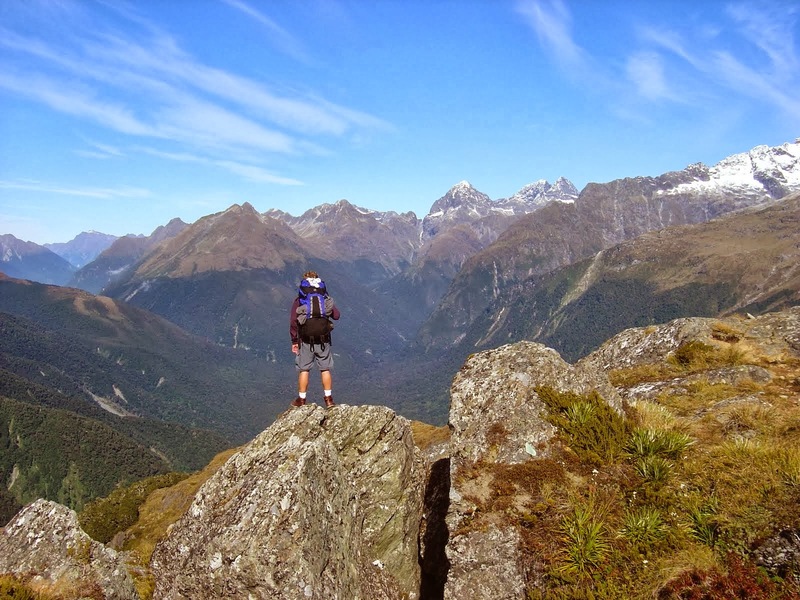 The Routeburn track is one of the premier multi-day treks in New Zealand. It's one of the Department of Conservation's Great Walks; it boasts of surreal alpine views at the partly altitude of 1000 meters and it's typically booked out at least 6-9 months in advance. Waller and Charles trying to find a rock to climb under to escape the rain. It was a blast and we had a great time, but it also was one of those stories that sounded better in hindsight. We didn't have any pictures to show of the alpine because all we saw was the side of a cloud for two days straight. Three full days of pristine mountain beauty with picture perfect weather. I looked at their pictures and couldn't pick out a single point of familiar reference from their trip because, well, they didn't have a picture of my water logged shoes with rain dripping down my jacket hood. Fast forward to when Kate and I decided to include New Zealand on our trip and one of the first things I did was book two nights on the Routeburn. This time, my luck would be better. This time, we would have perfect weather. This time, I might even see a mountain peak. The weather forecast for Day 1 of the hike was bad and, boy, did it deliver. On the way up to the trail head shelter our driver (helpfully?) says, "Well, I've seen it worse before." Thanks buddy, you've been working here for the past 40 years; GOD I hope you've seen it worse before! It's dark, cold, rainy and foggy- welcome to my worst fear coming true. That little voice in my head kept saying, "Oh no...it's happening again..."
Let me cut to the chase, we got drenched. More wet than ever before. More wet than when I was with Waller and Nate. It was a down pour that we double timed to the hut through. We saw some great forest streams (swollen, of course) and a lot of our hiking shoes as we tried our best to avoid the puddles, and streams and rivers we were crossing. Kate was a champ and smiled the whole way. You can only imagine my disappointment. I kept on thinking, "I'm going to do this hike twice and I'll not see a single mountain peak... I've seen this all this before. Only now I have different shoes..."
Once we made it to the hut, the day took a fortuitous turn for us. After lunch and attempting to dry off, the clouds broke and we had a few hours of !glorious! sunlight and views. We took advantage by hiking up to a look out and I actually saw both the valley floor AND the tops of the mountains. This is significant progress. We also met our new favorite Kiwi family, the Coopers, and spent the rest of the night talking with them, trading stories, eating dinner and enjoying good laughs. Kate became fast friends with Amy and Zoe and everyone was completely bummed when Amy got robbed of the big chocolate bar prize in the hut competition that evening. Despite the obvious slight of the Hut Ranger, things were looking up. Day 2: Routeburn Falls hut to Lake Mackenzie hut; cross over the highest saddle at Harris Saddle; side trip to Conical Hill summit, 14 KM, 5 hours. We go to bed the night before with a forecast for Day 2 of our hike to be snow, heavy rain, low cloud cover and a disappointed Charles. If there's any day that you want to have good views on the trek, it's this day as the hike today takes you up and over the mountain pass and has you walk on the side of valley through (apparently) a beautiful alpine landscape with soaring mountain peaks surrounding you. Instead we were looking at snow and rain. Needless to say, Kate and I were elated when we woke up to fog, a light drizzle and no snow. It's amazing what will make you happy when you have such low expectations. Our shoes were wet and the clothes were still damp from the day before but the weather held for us as we hiked up to Harris Saddle. The good part about the quickly changing weather in the mountains is that in between bits of drizzle, the clouds would clear for a time to show us some of the mountains in the background. It would be a stretch to call it a pristine day weather wise, but we were happy with the outcome. So happy, we even decided to make the side trip up to Conical hill to see more alpine scenery through the passing clouds. The long hike ended when we descended quickly into the Lake Mackenzie valley after following the ridge line for a few hours and found refuge by the hot fire in the potbelly stove. As Kate beat me again in cards, we watched the worst weather of the day pass by as it rained for the next 4 hours straight. We had gotten lucky and were very happy with the results. WHOOOHOOO!!!! Redemption!!!! Mountain peaks and beautiful days; they exist on the Routeburn! Finally. Amazing views down the Southern Alp valley of Fiordland National Park!! We couldn't have been more excited to end our hike on a high note with the memories of the past Routeburn sponsored drenches burned away by the warm New Zealand sun and the bright blue sky. 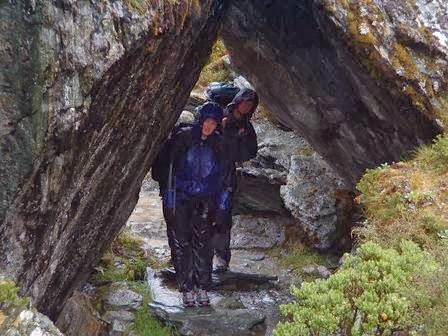 Editor's Note: Check back in a few days for a different perspective on the Routeburn hike; this time from a Hobbit! (Actually, not a Hobbit, but a very talented 13 year old writer, artist and guitar player from Wellington.) Amy Cooper, who we met along with her lovely family at the Routeburn Falls hut, and can be seen as the first hat from the left in our picture with the Coopers above, will be providing us with a guest post!